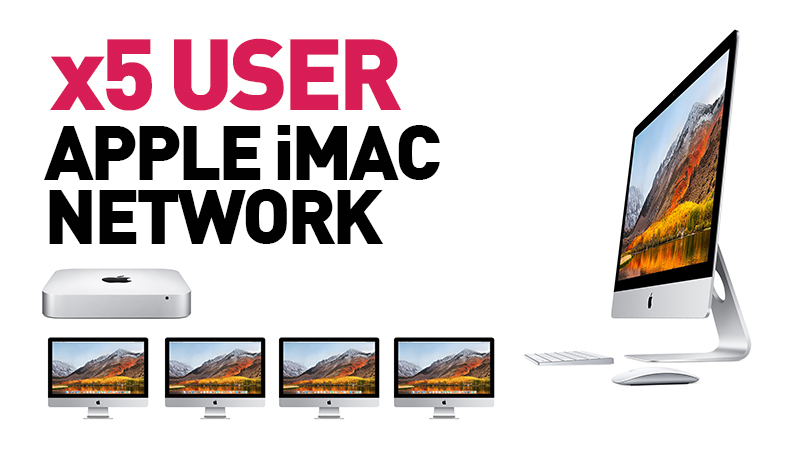 Mac mini with OSX Server + 5 Apple iMacs + Support & Optional Installation Our standard 5-user iMac network is the perfect leasing solution for small creative businesses. Starting at £58 per week plus VAT on a three-year flexible lease with an inclusive warranty; It offers you an upgraded spec. 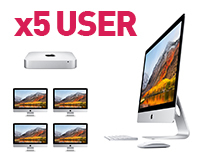 Mac mini Server with 16GB and OS X Server plus the five new iMacs. Microsoft Office for Mac 2016 or Office 365 can be added for all Macs as can printers and other peripherals. All leasing packages include everything to run your business with three years telephone /remote support and an option to upgrade to on-site hardware maintenance. Cabling and installation costs can be included in your lease.